"I was sixteen the first time my grandmother died . . ."
Sarah Parsons has never seen Amber House, the grand Maryland estate that's been in her family for three centuries. She's never walked its hedge maze nor found its secret chambers; she's never glimpsed the shades that haunt it, nor hunted for lost diamonds in its walls. But all of that is about to change. After her grandmother passes away, Sarah and her friend Jackson decide to search for the diamonds--and the house comes alive. She discovers that she can see visions of the house's past, like the eighteenth-century sea captain who hid the jewels, or the glamorous great-grandmother driven mad by grief. She grows closer to both Jackson and a young man named Richard Hathaway, whose family histories are each deeply entwined with her own. But when the visions start to threaten the person she holds most dear, Sarah must do everything she can to get to the bottom of the house's secrets, and stop the course of history before it is cemented forever. 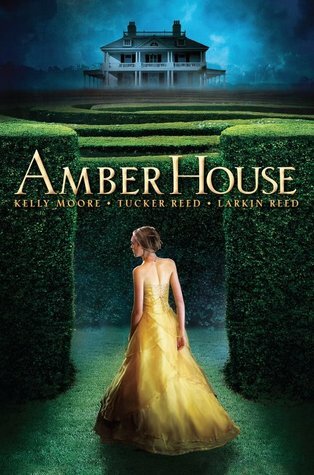 Amber House is a beautiful, rich and compelling, dark and creepy Gothic YA book, and it is ohhhh so good! Sarah is the main character in the story, but her little brother Sammy who is autistic, her mother, Jackson, The Senator and his son, Richard all play big roles in the story. At the beginning of the book, Sarah and her family have just arrived at Amber House for her grandmothers funeral. Sarah and Sammy have never been to Amber House because their mother and grandmother had a difficult relationship. After the funeral, her mother informs them that she intends to sell the house, and Sarah and Sammy convince her to let them stay at the house while she gets things ready for the sell. Sarah's mother decides to have an open house of sorts for the house in the form of a big ball for Sarah's 16th birthday. The Senator, who was a childhood friend of mom's, and his son Richard offer help in any way they can. Richard takes Sarah to a party to introduce her to his friend's and they start dating. She is crazy about him and he seems to be crazy about her. In the meantime, Jackson, who lives on the Amber House property with his grandmother, tells Sarah about a treasure buried on the property, and they decide to search for it together. Sarah had been having strange feelings and emotions since she arrived at Amber House, but during the search things turn even weirder. And it gets really good! And.... that's all that I am going to say about it! Except for this: the ending gets crazy, and it leaves you hanging, wondering what the heck just happened! It really is one of those books that you just have to read for yourself. Go for it, you know you want to! And I think you will love it! I had a hard time connecting to this one. It just didn't work out for me. However, I do see how it could appeal to a lot of people. Glad you enjoyed it! I'm sorry this one didn't work for you. It is always interesting to me, how one book can appeal to one person but not another. Thanks for checking out my review and commenting! Have you found any books similar to this one that you have connected to?